Uhhh what does those three number means in the poll because Im confused? It means three! It makes perfect sense! You have revealed the secret, now I will have to eliminate you! We Got to page 10! Thank you Very Much for supporting this project! A) 0x84 It is related to that annoying line that is at the bottom of all levels, also seems to be responsible for controlling the deletion and refreshment of some objects. B) 0x9a It is related to the physics of water and the counter to drowned. 0x07e17b Here he sent me the debugger. 0x07e1d0 Writing EA the line disappears, but the rings and other objects are no longer eliminated. 0x07e1da Writing EA the line disappears, but the Sonic controls do not respond. B) The physics of water do not alter the speed of Sonic, but exerts resistance on their movements, for that reason Sonic can not upload to some platforms of the Labyrinth. 0x07eadb Here he sent me the debugger. 0x03aa4e Here is the subject that is heard before drowning. When this counter reaches 30 Sonic begins its cycle before drowning. Enter 35 36 37 numerical counter is activated. * Even so their animations work normally. ** When I transcribe Familikid's data to the game, I'm not sure, but I feel that something changes, anyway when making a spindash the game is blocked. Since you've mentioned labyrinth zone, you've just reminded me of something. In the original game, and I'll also assume* this one too, not all of the... bubble dispensing... things... actually produce bubbles (like this one here). Now, I have no idea how this game handles objects so I'm just wondering if you intend to fix it at some point (by adding or modifying other objects). You could alternatively just remove the tiles for the "bubble dispensers" that don't work. Hey Sics, About Last Time On The "Sonic Team Presents" Text Needed For This Game... When You Told Me If I Was Going To Redraw All The Letters Or Something Like That...? I Was Trying To Say Is I Don't Really Know, All I Did Was Use Tile Layer Pro And Stylized The Text With The Sonic Pocket Adventure Fonts, But Bigger Since Redesigning Them To Be Closer To The Sega Genesis Version Would Take An Extreme Amount Of Time, But Editing The Somari Team Presents Thus Changing It Back To Sonic Team Presents Was Totally Worth It! (Old Man Jenkins): What Did I Miss? Oh, yikes. This seems like a big problem. I haven't played through the game in a few months, so I totally forgot about this. This shows off a collision glitch in Marble Zone, that's pretty easy to come across if you know what to do. I wonder if it would be possible to implement the Drop Dash in Somari? Bootleg enthusiast and ROMhacker extraordinaire. Hey Sics, In One Of Your Latest Posts, You Said It's Horrible To Work Alone... Are You Planning On Getting Some Help For The Upcoming NES Improvement? For Example: Amilgi Can Do Some Audio Improvements Such as The Ring Sound Effect, The Original Is Still Too High Pitched! White Fox's Improvement On Sonic For The NES Is So Amazing. I Think He Should Help You Out On The Bug Fixes Such as Sonic Popping Up Every Time He Uses His Spin Dash To Attack The Robot Badniks and The Loops That Causes Sonic To Not Be Able to Grab All Of The Rings But To Only Miss One Ring! What You Do Think About It... Also, I Hope You Secretly or Actually Found a Way To Add The New Title Screen To The Game Unless You Plan To Do Something Else With It! And One Last Thing, How Goes The Rest Of The Improvement? Hey Amilgi, Are You Planning On Doing Some NES Music Improvements For Street Fighter II, Super Mario World, Kart Fighter, Mortal Kombat II, And Some Other Bootleg Games For The NES? ● Do you plan to fix the Labyrinth air dispensers? At the moment I am not sure, I would really like to solve the problems of the Labyrinth, but I want to do it consistently, that is why it is necessary to understand what I am facing to know what this setback implies objectively. ♦ First of all, the bubble deposits are just graphics embedded in the stage blocks, which is really responsible for generating the air bubbles is an object that could be added in any sector of the scenario. ♦ Also the levels are composed in a similar way to the runners of the old cartoons, it means that they are only a sequence of images repeating over and over again, but in a more elaborate way. ♦ This causes that in some sections of the route, the scenario ends up being saturated with unnecessary air dispensers, if they all work, added to the fact that Sonic resists 60 seconds if breathing, the air administration mechanics would be damaged. ● Failure report in Marble. Sorry for the old capture, I was going to talk about this in the past, but I forgot . On the other hand I was analyzing the code of the original screen of Somari Team but I did not get very far with that, although I managed to understand quite how it works. ● Are you considering seeking help for this project? ♦ Before you can request the help of Amilgi it is necessary to find someone with the required to insert their compositions to the game, otherwise it makes no sense to disturb him. Actually the blocks of data that I am analyzing, I study them in order to be able to use my title screen, among other things. Anyway if I do not achieve my goal I have several alternatives, such as making a new version of the title screen optimized to fully exploit the space with everything and its limitations. Note: Is too early to decide that, so I repeat that it is best to be patient, I am too perfectionist with everything related to graphic design, so I plan to take as much time as I consider necessary to achieve the maximum of the objectives I pursue. ● Do you plan to implement new mechanics to the game? In the original Somari the air byte is $9A and this counts up. PRG ROM $2E5B8 increases AirLevel ($9A) by 1. PRG ROM $3CBB5 compares the AirLevel ($9A) with #$3D and then jumps to $3CBBB if the carry flag is set. PRG ROM $2A293 compares the AirLevel ($9A) with #$3C and then jumps to $2A2A0 if the carry flag is set. PRG ROM $3A281 compares the AirLevel ($9A) with #$30 and then jumps to $#A28E if the carry flag is set. PRG ROM $3AA2E loads #$3B into the accumulator, sets the carry flag, subtracts the AirLevel ($9A) from the accumulator, stores the accumulator in $28, and branches to $3AA41 if the zero flag is set or jumps to $3AA39 if the number isn't negative, then compares with #$06, then jumps to $3AA42 if carry flag is clear. I've tested adjusting the air time by subtracting 10h from #$3D, #$3C, #$30, and #$3B and the music, countdown, and death all played when expected. The Sonic Team Presents and The SEGA Logo Mockups That You Made Looks Amazing and I Hope You'll Find Somebody Smart Enough To Add a Sega Logo Screen and a Sonic Team Presents Screen! Also, Did Anything New Happen To Star Light Zone? link to one of your mockups there is broken. Plz fix, I'd love to see it! I started making the changes you mentioned, everything worked perfectly, then I expanded the rom to get the necessary pointers to make the changes in the version that Jabu & Ti modified. But as in my tribe have not invented the fire yet, although at first glance it seems obvious that I am in the right location and everything works correctly, that little doubt forces me to ask Am I right? Note 1: I have assumed that the version of the game you are referring to is "Somari (SOMARI-W) (Unl) [!]" Since it is the only one that matches your description. I didn't think to check if code was moved around between Somari and Jabu & Ti's version. Also, when comparing the old addresses with those provided to me, everything seems to indicate that except for a few bits it is a duplicate sector. Could it be that it is not used or will be used under any specific circumstance? For the time being I will test this new modification as much as possible, although in any event I plan to replace the values ​​of the sectors of the code that seem to be not being used, I think it is best until it is verified that this block of code has no effect on the game. Hey Sics, Did You Perform Any Tests On One Of The Levels For Sonic The Hedgehog On NES? Are You Thinking Of Add The Unused Sprites For Dr. Eggman Where He's Falling and Running After Defeating Him In The Final Zone, I Found Something Like That In Somari and It Can Be Found In The Cutting Room Floor Website. Are You Also Going To Think Of Adding The Unused Drown Sprite Where If The Timer Reaches 0 While He's In The Water, He Drowns To Death!? Would It Be Really Impossible to Add a Checkpoint Monitor and It Make It Work Perfectly Like In The Game Gear/Master System Versions Of Sonic 1? 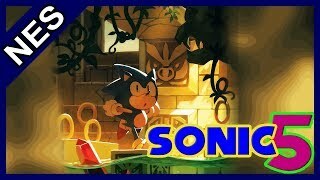 I Honestly Love The Improvements You Did On Green Hill Zone Since It Was One Of My Most Favorite Levels In Sonic 1 and I Really Like Amilgi's Music Track Version of Green Hill Zone Since It Sounds Much Better Than Hummer Team's Version Of Green Hill Zone! I Hope The Improvement For The Rest Of The Game Gets Finished Soon... I Almost Forgot, Any Status Report On Scrap Brain Zone Yet? ● Did you do more tests? ● What changes will Eggman have? ● Restoring the zero in the countdown? No, this is not possible because all the space on the tile is already occupied. ● Is it possible to restore control points? ● I wish the wait would over. Before I felt the same, but I decided to take things more calmly. ● Information about Scrap brain?